Who has your Passport? Is your passport with you or with your Company? When it comes to original Passport, everyone wants to retain their passports with themselves, and yes it is necessary to keep your passport with yourself, as you can take benefit of it while travelling on emergency situations. 1: Can employer retain our Passport? 2: Is it legal to detain employee passport? 3: My company is not giving me my passport, what to do? 4: How to receive my own passport from Company? 5: What UAE Law says about Passport? 6: Is there any fine on Company, if they keep our Passport with themselves? 7: How to register a case against employer? 8: Provide legal wording from decree (article)? 9: Is passport is the property of our company once visa stamped on it? 10: What Ministry of Interior said about Passport ownership? We have answered all above questions in below Guide, Please read it and share it for awareness. Who is the owner of Passport? 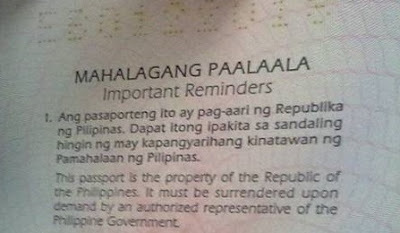 "This passport should be in the custody either of the holder or of a person authorized by the holder". While we all have to hand our passports over to authorized bodies to obtain visas, individuals are not supposed to hand them over to unauthorized bodies and that includes to employers, apart from for affixing visas. What UAE Law says about Passport? The UAE Government officials have repetitively stated that no employer should retain an employee’s passport, yes read it again, No employer should retain an employee’s passport. 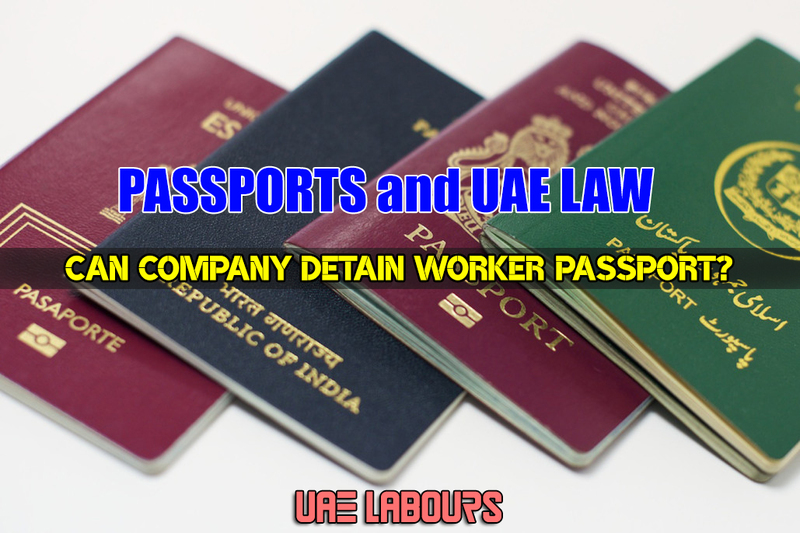 According to the legal department of (MOHRE) Ministry of Human Resources & Emiratisation: "Retaining workers’ (employee’s) passport also amounts to forcible work in violation of the International Labor Organization (ILO) Convention on the Abolition of Forced Labor, to which the United Arab Emirates is a signatory". “The confiscation of passports is an illegal procedure as the passport is a personal document and is considered the property of the country which issued it. “Passports should not be confiscated until there is a court ruling stipulating that or in accordance with judicial or public prosecution orders. What Ministry of Interior articulates about Passport ownership? "As the passport is a personal document and as the law obliges its owner to keep and show when required by the governmental authorities, it is not allowed for any party to detain the passport except by the official parties with a judicial order and according to the law. Consequently it will be considered as an illegal action to detain the passport in UAE except by the governmental parties." Is there any fine on Company? Yes, UAE employers detaining workers’ passports can be jailed and fined up to 20, 000 AED, in simple words the offence carries a jail sentence and a fine of up to 20K AED. What to do if employer refuses to return Passport? If an employer (company) refuses to return your passport, you or any individual who are facing passport detaining issue from his/her employer can register a case against them at their local labour office and even file a police case against them at nearest police station or through official site/app of Local Police. “In case where an employer has confiscated the passport of an employee under any pretext, the employee has the right to go to court, according to the stated procedures. “The UAE laws and jurisdictions guarantee the expatriate worker’s right to go to court. The UAE courts have issued many verdicts that obliged the employer to return the employees (worker) passport and to pay the court cost. Please share this Important and very informative Article with your friends, colleagues and family members on social sites for awareness from below, thousands of expats are looking for such informative articles here in UAE. Your 1 Share will be appreciated and it is enough to help someone. I resigned from my company and my company already cancelled my visa but they keep my passport telling me that i need to exit the country and will give my passport at the Airport, they held my passport for the reason that they told me they are still liable for my stay and the company will be black listed if i over stay. Due to bank issues i'm not able to travel, I'm still looking for a job. Is the company have the right to keep my passport? What if i cant find a job until my grace period expires, will i be black listed too? Thank you very much for your helpful information for us labours in the UAE. I got hired in a company last week dubai (jlt). Out of desperation and frustration because my visit visa is about to expire in 2 weeks, I grab the job. They let me sign the offer letter, the contract, and other forms related to my employment and visa with them. One of the papers that I signed is about my visa, that my working visa with them will actually be paid by me and not by the company. It is a written letter stating that I am borrowing a money from the company to process my employment visa with them, that they will just deduct the payment of my visa through the salary I will get in the company once I'll start working with them. Another thing is, I should surrender my passport to the company for "safekeeping" but the HR Assistant told me that if I needed it, I can just fill up the form and they will release it (which I highly doubt). Another sketchy thing that I noticed is that, when I was asking if I can take home and read the contract before signing it, they told me that I have to sign in front of them, which (stupidly) I did. I also asked if I can have a copy of the contract that I just signed but the HR assistant told me that she can give it to me tomorrow. I started working as an accounts assistant right the next day and I am still asking for a copy of the contract that I signed the other day but they (the HR Assistants and HR admins) kept on asking on why do I need a copy of it, I told them that I just want to read it again but it seems like they are hiding something and doesn't want to give me a copy of the contract. I know that this isn't the "legal" contract but just an internal contract between the company and the employee because the legal contract would be approved by the UAE government with arabic words in it. But still, isn't it the right of an employee to have a copy of it. I stayed with them for a day and it feels like there is something off in the company that I don't understand, it's a feeling that I am not comfortable with. I always trust my intuition because it never fails me so when it felt like i don't belong in the company I filled my employment withdrawal the next day, they released my passport, good thing they haven't processed my visa yet or else i will pay the company 5000aed. As an expat in this country, we should be very very careful in signing documents and contract making sure that the company also cares about you, their employee and not just focused on the growth of the company. And also be very careful because there is a high chance that even the government won't care about you when bad things happen, after all money plays a very crucial role in everything and we're just a mere employee. I got hired in a company last week at jlt dubai. Out of desperation and frustration because my visit visa is about to expire in 2 weeks, I grab the job. They let me sign the offer letter, the contract, and other forms related to my employment and visa with them. One of the papers that I signed is about my visa, that my working visa with them will actually be paid by me and not by the company. It is a written letter stating that I am borrowing a money from the company to process my employment visa with them, that they will just deduct the payment of my visa through the salary I will get in the company once I'll start working with them. Another thing is, I should surrender my passport to the company for "safekeeping" but the HR Assistant told me that if I needed it, I can just fill up the form and they will release it (which I highly doubt). Another sketchy thing that I noticed is that, when I was asking if I can take home and read the contract before signing it, they told me that I have to sign in front of them, which (stupidly) I did. I also asked if I can have a copy of the contract that I just signed but the HR assistant told me that she can give it to me tomorrow. I started working as an accounts assistant right the next day and I am still asking for a copy of the contract that I signed the other day but they (the HR Assistants and HR admins) kept on asking on why do I need a copy of it, I told them that I just want to read it again but it seems like they are hiding something and doesn't want to give me a copy of the contract. I know that this isn't the "legal" contract but just an internal contract between the company and the employee because the legal contract would be approved by the UAE government with arabic words in it. But still, isn't it the right of an employee to have a copy of it. I stayed with them for a day and it feels like there is something off in the company that I don't understand, it's a feeling that I am not comfortable with. I always trust my intuition because it never fails me so when it felt like i don't belong in the company I filled my employment withdrawal the next day, they released my passport, good thing they haven't processed my visa yet or else i will pay the company 5000aed. As an expat in this country, we should be very very careful in signing documents and contract making sure that the company also cares about you, their employee and not just focused on the growth of the company. And also be very careful because there is a high chance that even the government won't care about you when bad things happen, after all money plays a very crucial role in everything, we're just a mere employee.